In a quart jar layer the lemons and lemon verbena sprigs. In a bowl combine the vinegar, sugar and a pinch of salt, stir together until dissolved. Pour this mixture over the lemons and top with a non reactive lid. Gently invert 2-3 times. Place in a cool dark place for 1-2 weeks. Invert 1-2 times a day. 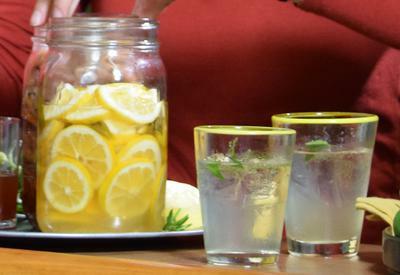 To serve: strain lemons and herb sprigs. Pour 2-3 tablespoons in a small glass of ice and top with sparkling water. Enjoy on a hot day.